Washing agent designed to eliminate excess salinity during the final stage of development. 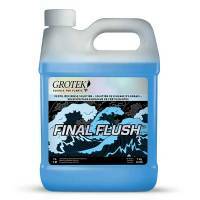 Salinity can become a problem for the grower, can cause growth problems and bitter fruits, Final Flush is a washing agent designed to eliminate excess salinity during the final stage of development. 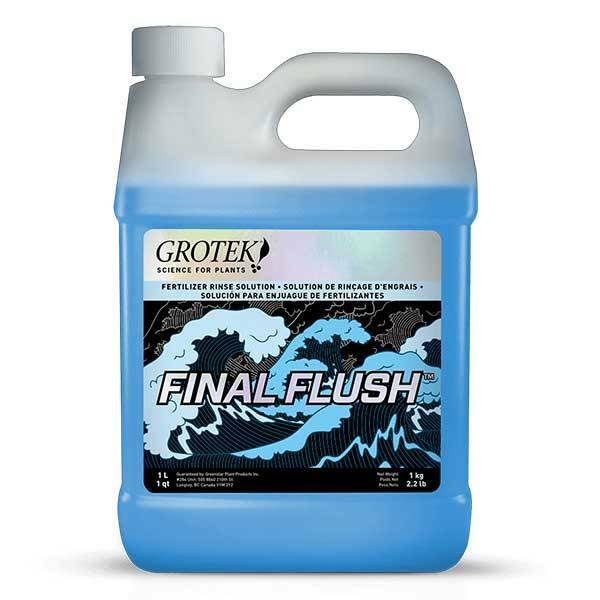 Grotek Final Flush is a solution containing several active ingredients for washing the substrate in case of excessive fertilization and consequent accumulation of mineral salts around the root system. The function performed by some particular organic acids is to eliminate the non-assimilable salts from the plants from the substrate and clean any accumulations of fertilizers crystallized by hydroponic or irrigation systems. Not always more is better! As growers, we always try to get the most out of our crops pushing to the limit the capacity of plants, but we do not always do it right and often an excess of fertilizers can be harmful and counterproductive, leading to an opposite effect to that desired or even to permanent damage to plants. Using Final Flush before the final rinse phase forces the plant to use the mineral salts it may have accumulated during its entire cycle within its tissues. This mechanism guarantees a final harvest of first quality in terms of flavour. For growers more concentrated on quantities, there are different products suitable to add carbohydrates in the final flowering phase of the plant, thus ensuring an optimal harvest. When using Final Flush in cases of over-fertilization, a good way to make sure that it has done its job properly is to measure the wastewater that escapes from the bottom of your vessels, once the salts have reached the desired levels, fertilization can be restarted with caution.